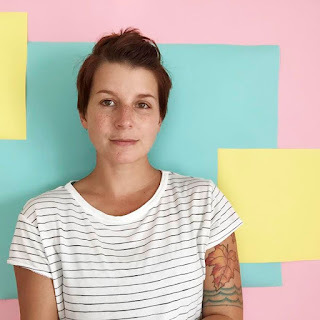 Brittany Marcoux is a photographer based in Boston and the creator of The Shore Project, a rephotographing of Stephen Shore's Uncommon Places. 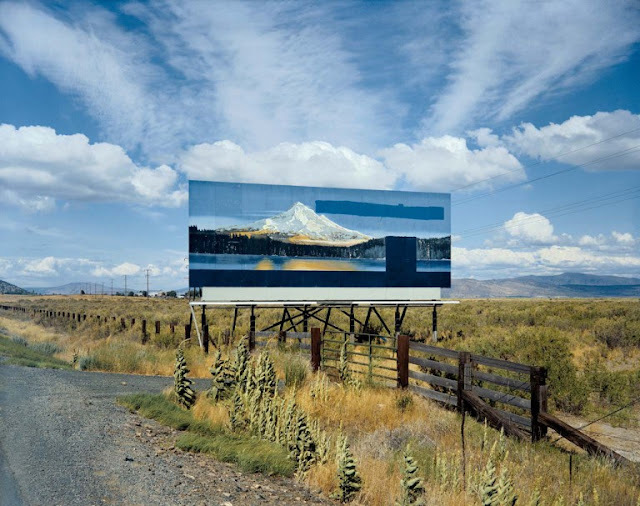 Blake Andrews: Can you recount how you first became interested in Stephen Shore, and how your Shore project began. I know Rangeley! We spend a few weeks each summer near Skowhegan, and my father-in-law has a property called Quill Hill near Rangeley. Do you know either place? Yep, I know of Skowhegan because they run a residency which I have looked into doing, but I think it's more for painting. Skowhegan School of Art. It's very close to my in-laws. Did you ever visit the Wilhelm Reich Museum in Rangeley. Yes! What a wild place and interesting individual he was. My in-laws visited us one weekend and we took them there on one rainy, cloudy afternoon, which was fitting. I actually got yelled at by one of the volunteers for taking a photo inside the museum. Apparently that is not allowed. I couldn’t help myself. There were just so many interesting things! Rangeley sounded different and fun, although not connected to photography. I figured it could be a great opportunity to make some work and figure out what I wanted to do. My husband is also a teacher and had the summer off so it seemed like a perfect opportunity. I knew we were going to be living in a tiny cabin without electricity (only propane lights) so I brought a bunch of books and cameras and other essentials, of course. One of those books was Stephen Shore's Uncommon Places. Which Uncommon Places was it? The original or the recent one with more photos? Being 2010, I had the original one...which I am sticking to for this project. I am not going to try to re-photograph the newest edition that came out. I may change my mind someday, but for now I want it to stay true to the idea that first formed from the copy of the book I had and still have. It's completely falling apart now, full of duct tape and writings....it's become kind of an art piece in itself, haha. Trying to photograph all the new photos added would be a lot of work. It's a lot of work already doing the original. How many photos are there again? There are 144 images in the book. I have completed 58, so I have 86 to go! Which is exciting news...I still have a lot of territory to explore, esp. Texas, Arizona, Florida, Arkansas - I am going to have to spend a long time in each of these places. Why did you have the book with you originally? Was it just on a whim? Or were you a big Shore fan at that time you lived in Rangeley? I was always a fan of Shore’s work in general. I was first introduced to American Surfaces and then Uncommon Places . I am a pretty nostalgic person. I think about the past a lot (even within my other bodies of work) and there was always something that drew me to looking at his images. I was born in 1986, so I only saw these types of cars, landscapes, and downtown streets from my parents' old blurry snapshots. It felt similar to looking back on their past, I suppose. I was drawn to the colors, the light, the prices of gas, and comparing all these elements to current times. Hmm. I guess that's one of the central questions about Uncommon Places. Are the photos interesting for how they're seen and composed? Or due more to nostalgia for subject matter, the old cars and old signs, etc. I think the photos were pretty well respected at the time they were made before nostalgia could enter the equation. But at this point it's hard to say. Photographers are unconscious historians. We can't help it. And all photos get more interesting over time. Shore's perhaps more than most. Absolutely. I contemplate about that all the time with his work. How did you find the first Shore scene in Maine? I am looking at your pairing and I don't think I'd recognize that building. Well, one day in Rangeley I realized that we were very close to Mexico, Maine, and so on our day off we went out and explored. We wanted to see if the little bar he photographed in 1974 was still there, just for fun. When we arrived we realized that this particular street (Bridge St.) had changed quite a bit. After asking some locals for help, we found the spot. The building was no longer there but a similar one was in its place, and the street name had changed to Main St. On the surface it looked completely different, but we slowly started to notice small things....the fence, the crosswalk...even the curb on the sidewalk. These tiny elements visible in Shore’s image due to the clarity of the 8x10 camera, all remained after almost 40 years! And this started the whole project. We were hooked after this one location. When you say "we" I assume you mean you and your husband? Is he a creative collaborator in the project? Yep, my husband Brian has been there from the very start of this project and we have gone on all of our road trips together to re-photograph...even our honeymoon! He is not a photographer, but a writer and a musician, and just as interested in this project as I am, thankfully. It is always nice to have a road companion. Why do you think Shore photographed that scene in Mexico originally? What was it about that location? I realize we can only speculate. Any ideas? Well, I think Shore was mostly interested in composition and symmetry...When you see this building it is so square...it's really an odd shape. I often think about the shots he took, and when we find them now I wonder if he would take the photo today...Most of the time I don’t believe he would….especially not in Mexico, Maine. You mean if he was a younger Shore seeing it now? Or current Shore? Funny, I never think of younger Shore...I think of him now, and probably because he is still so popular and making work, and making new bodies of work. What do you think of his current photos? I'm thinking of his Instagram feed which I'm guessing you've seen. Has his style of photography changed? No I don't think so, I think even his instagram account has some similarities to the formal elements in Uncommon Places or even American Surfaces…It's just a different camera so the format changes....but the content and awareness of the environment, and his way of seeing all feels like Shore to me. His instagram account is a little more intimate, with photos of his garden and Ginger, which is fun. But, if you take his recent work from the Ukraine, there are moments that feel right out of Uncommon Places, especially some of the portraits and the image on his website of what looks like a hotel with pink wallpaper and bedding - he loves hotels. Let's put it this way. Do you envision someone ever rephotographing his Instagram photos? Do you think they have that type of magnetism? Nahh, I think it's harder to stay connected to Instagram photos...in the same way that one can become connected to a book or actual prints…It's more intimate. Well, what if he made a book of them? Don't consider the format. Just what's in the photos. Haha, still not the same. I also think the big draw for re-photographing Uncommon Places was that they did seem so thought out and calculated...and he gave the exact location in the title. It's interesting to compare to Eggleston's photos. You might think of them existing in that stylistic void between Uncommon Places and American Surfaces (ok, maybe not exactly, but bear with me for the sake of argument). They're from the same time period. But I doubt many would be tempted to rephotograph Eggleston. There seems to be something specific to Uncommon Places which invites reinvestigation. Yeah, they were just inviting someone to re-photograph them....and I know a few other people have made some local attempts, as you have even shown on your blog...but I am not sure anyone else is trying to do the whole book. If so, maybe we can collaborate and share stories (email me if you are out there, haha). I guess I'm asking because to me his Instagram photos don't seem as considered. I think that's just the nature of Instagram. But also maybe his changing vision. As you say the pictures in Uncommon Places seem very thought out. Like he spent hours plotting the position and timing. And then the captioned date and location help nail it all down. Yea...I never felt the urge to re-photograph American Surfaces, because those images always felt more candid and instinctual, something that cannot be replicated. American Surfaces is more interesting than his IG for me. Maybe it's the nostalgia thing creeping in because they have all these 1970s artifacts. Who knows. There was definitely a harder edit back then, even with something as prolific as American Surfaces. The act of taking a photo implied a stricter curation. And then before they went out into the world the images were culled even more. But it's not just about editing. I think he was more visually attuned. I think the 8x10 camera in general makes for a much slower process, whereas shooting with a 35mm, or iPhone, or even medium format allows you to be a bit more fluid. Do you shoot 8x10 at all? I don't shoot 8 x 10. I've tried 4 x 5. Not my thing. I thought about doing The Shore Project in 8x10, but then I thought "Hmm, would Shore do that now?" I am inclined to think he wouldn't, but I am not sure. Also, the price would just make the project impossible. Shore has a made some public comments about the price of sheet film shooting Uncommon Places. It was definitely a factor in the project. Right, and it is a lot more expensive now. For a pack of (10) color sheets it is $164 (on B+H)...so that’s $16.40 per shot before processing/scanning fees. I stated above there are 144 images. It would cost $2,361.60 to shoot the project. And that doesn’t even account for multiple exposures! I use a Canon 5D Mark II...I just shoot farther away than I need to in order to adjust for perspective shifts. I won't reveal all my editing secrets though, haha. I noticed on your blog several examples with grid lines, etc. It looks like you try to nail down the viewpoints as close as possible to the original. Why is that important? Yea, that was such an important part of his shooting. He really considered how one object in the landscape connected with another and the spaces between each element...I don't want to alter that space. If it is still there —the roof of a house, a telephone pole, a tree— I will try and line it up as accurately as possible to the original, whether this is in camera (which I aim for first) or in post-production. Do you think such an analytical approach might affect your appreciation for the sites? For example, when I look for photos on my own a lot of the decision making comes down to intuition. Maybe Shore found his sites this way too, I don't know. But you're taking a counter approach. Lots of research, then very specific remapping of the image. Can you still feel the sites, I wonder? Absolutely. It is really a crazy a feeling when you stumble upon the correct spot. He doesn't always make it so easy, haha. We have met so many people throughout this project because we needed help finding a street or finding a business that has relocated over the years. We have shared the book with folks whose parents owned certain establishments (like Davey's Motel in Ironwood, Michigan) or homeowners that didn't even know their house was in a famous photo book (such as Natural Bridge, NY)…It has been a great experience to share. How much research do the rephotographs generally take? Do you usually find the sites right off? Or is it more like Mexico, Maine where need to chat up locals. Some are easy, like the Great Barrington, MA photo. This one was a piece of cake. Not only does he give the street name, but the number on the house is visible. And then some are harder than others, actually impossible. Take the photo on the opposing page from Brooklin, Maine - no other description and it is of a mobile trailer selling fish-n-chips. If anyone has any leads on that one, please help! I don't generally like to do too much research beforehand...we will use an actual map, or Google maps if need be. But as far as looking up locations before we get there, I feel it ruins the adventure for me. So it's not all about the photos. But also about the road trip and the experience of looking. The process. Yes, 100%. One of our best moments so far was on our most recent road trip through Canada this summer. The Terrace Bay, Ontario house.... We NEVER thought we would find it. Shore didn't give a street name on this one, so we were traveling blindly through the small town. After 6 years of working on this project, we kind of have an idea as to how he traveled...this was our only saving grace. He did not go too deep into each town. Something always caught his eye right away....and he always stayed on the smaller 'routes' throughout a place. That's interesting. He was sort of a surface level traveler? So most of the sites are on the leading edge of town? Yep, for the most part (that we have discovered so far), he was right off the route 6's, 1's, 2's and all other ones that run through America…and Canada as well as we discovered. Not Interstates though? I guess many weren't built at the time. Exactly…these were the main roadways back then...in these areas anyways. My interstate knowledge is a little fuzzy. I believe the interstate highway was created in the '50s so it was around, just not fully completed in some areas. It also might have to do with him looking for more interesting parts of America and traveling the roads that he probably traveled on when he was growing up. As we all know, you really cannot see much from the highway, you really have to hit the backroads to explore the true nature of a state. So how'd you find the Terrace Bay house? We drove into two little neighborhoods, felt discouraged, and decided to try one more. From inspecting the photograph, we could tell that the house was most likely on a corner, because Shore is photographing from behind. He wasn’t really one to trespass into backyards or personal spaces, he liked public, agreeable access. We took a side street into a little nested neighborhood and sure enough there it was on the next corner. We noticed the chimney first and then it all came together. Wow. That seems beyond coincidental. A woman was gardening outside and we spoke with her for about 40 minutes. She and her husband had just moved there a week prior to us finding the house! It was meant to be. Her husband was in the hospital and we shared the book with her and she was so excited to share the news with him later. That made us happy. Maybe there was something in the structure of the town or road that led Shore there 40 years ago. And you there now? Yea, something was in the air, haha. We even got to keep a paint chip from the house that had the underlying green color from Shore's photo. It was now like a navy blue color. My other favorite part from this location is the tree, which you can see as a little sapling in Shore’s original. In my 2016 version, the tree (I like to think it is the exact same tree) is full size and has a swing attached to one of the limbs. Over the course of 40 years this tree has been there and has its own story, ahhh I love it. Trees are always a good visual indication of the time passing in these rephotographed images. It's ironic that the house was in the process of being painted during Shore's photo. I know, that must be what caught his eye. I was naively hopeful that it would still look the same, but that would be crazy. Did you send her a print? I do have her contact info and will be emailing her my version alongside Shore’s original, as I have them displayed on my website. Now that you mention the types of sites he liked to shoot it raises questions about some of his photos. What about the Philadelphia ones? They seem buried in the middle of a city, not something a traveler would casually stumble on. Any idea about those? Was he visiting someone? We have often thought about those ones, and they do stand out a bit, because he did not take too many in big cities (I live in Boston for instance and he did not shoot any there). So yes, I think maybe he could have been staying with some friends and went wandering around...or maybe he was in the city for some art event. Not really sure. I do know that those ones are much easier to find, especially the Philly ones. Big cities tend not to change too much. Houses change often, lil' mom and pop shops change a lot. But,big city buildings, or big churches like in CT - I can usually count on them still standing strong. I think what you're saying is that big cities change like any place changes. But large urban buildings generally last a while, especially if they're institutional. Yeah, in our experience so far. He has one on Market Street in San Francisco, I hope to find it this Spring. I can pretty much guarantee that it is going to look exactly the same. Sure, the cars will look different, and my shot may have a few more people in it...but those buildings will be there. With street addresses city locations are not hard. I think the other ones might be more appealing, if you just have a general highway or town and no address. It more of a treasure hunt. And you've been doing this long enough to have a feel for his photos. When you begin to find his sites that way you know you've stepped into his shoes. Yep, you can start to think like him, haha. It gets weird, but in a fun way. You've mentioned the spacing between elements in Shore's photos, and trying that match that. And the way he found sites, and beginning to find them that way on your own. In some ways you're beginning to think like him. What do you think Shore was trying to express with Uncommon Places? And how has your understanding of the book or his photography changed during your project? Hmm, I am not sure I can speak about what Shore was trying to express with this work. I do not want to cast any incorrect judgements, although I am sure I have already done that throughout this interview. I can, however, talk about what I am trying to express from rephotographing the photographs in Uncommon Places. 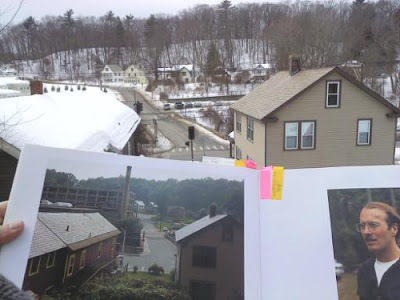 Ever since that first photo we found in Mexico, Maine I have been interested in the similarities or changes —architecturally, culturally, economically, and politically— that have occurred across this country since Shore was there in the 1970s. As we are traveling I think: What has changed over the past 40 years in a small industrial town like Greenfield, Massachusetts? What stories have been told over the past four decades in Post Falls, Idaho? In El Paso, Texas are there any more small businesses left and if so, who owns them? I like to raise these questions for myself, but also hope that through viewing the two images side-by-side it will inspire others to think about the past, the present, and the future of our country. Especially at a time when our country is going through this intense and often discouraging election. What do you think is more exciting for you? Finding a Shore site that looks almost the same as when he shot it? Or finding one which looks very different? As I stated above, I am dangerously nostalgic, haha. I enjoy them the most when they look the same. Arriving at a site that is almost completely unchanged after 40 years is amazing. It has survived so many things —weather, ownership, all the major political and economic shifts that this country has gone through since the 1970s — it says something about a place. It has roots. That being said, I do believe in a certain kind of progress. Let me explain with an example. In Shore’s photograph from College Park, Maryland of the Sidney Lust Drive-In theater, I knew it was going to look different before I even arrived due to its grungy appearance in 1976. What I feared was that it would become what it is now: A Costco. I wish it had progressed in as much as someone taking over the theater and improving its conditions. But that is not what is happening across this country. Costcos are what’s happening across this country. 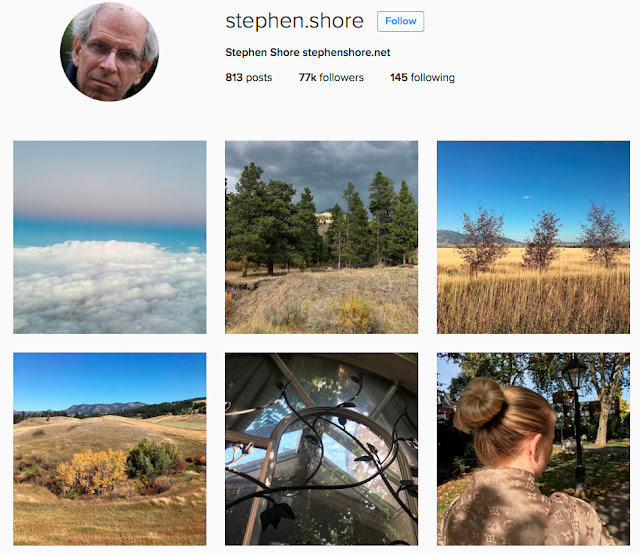 Does Stephen Shore know about your project? He does. He reached out to me this most recent trip via instagram. I wrote something on instagram from @theshoreproject account about having a hard time finding the Sugar Bowl restaurant in Michigan. He direct messaged me to help a little. I was pretty excited...you can imagine. An email to him is in the works, with a little book of all the ones I have completed so far. Yeah, I would read that. I'm surprised he still remembers the sites well enough to give directions. Not that he has a bad memory but that's a long time ago. So what does he think of the project? Haha, he didn't really say, but I took it as a positive message…..If he didn't like it, I don't think he would give me advice, right? Which is why I want to follow up with him, to have a real conversation about it. I've been dragging my feet a little on that...maybe I am a bit scared. Haha. Was the Shore project tied into your MFA program? No, completely separate, but I have recently discovered that the conceptual side of it is not all too different. My MFA work was all about my childhood and recreating my childhood home/memories from scratch (reimagining a place that I could never go back to). For this I used installation, video, and photographs. I still worked on the Shore project but not for school. The photographer as historian again. Where are you shooting next? And when you expect the project might finish? Well, I have a lot of editing to do from the summer trip. Then during spring break (my husband and I are both teachers now) we will be going out to Oregon, Washington, and California. Hitting up most of the West Coast locations. You should come say hi if in Eugene. We don't have any Shore sites in the city, but there's a famous one not too far away (Highway 97 with Mt. Hood billboard). I know the one, looking forward to shooting there. He must have shot it from his hotel balcony? It looks like there may be a pool to the left in the parking lot, and most of the time restaurants were right on the side of hotels/motels. Strange photo factoid which you may or may not know: Paul McDonough made a photo inside the same site around the same time as Shore. I think I saw that on your blog once. You do have an extensive knowledge of Uncommon Places, which is why I was so excited to do this interview. It has been a real pleasure! As an aside: The Shore exhibit at SFMOMA I saw when I was there in June had new prints of some of these photos on display, and Shore has said that a great deal of the nostalgic feel of those shots comes from the natural fading of the original prints over the decades since they were printed. And I could feel a difference in the new prints; the colors closer to what I remember from my distant childhood; they felt more immediate and evocative rather than literally tinged with age.